Refers to exploring the outside of the wreck, and that is probably the most common type. Two popular things to see on the wreck site are propellers and boilers, and they make a good subject for photography. Many divers get more pleasure from seeing the beauty of the wreck and the marine life around it as a whole. There is no special training, however, training for wreck diving will give you the skills to help you maximize the pleasure from non-penetrating wreck diving. No matter the type, the wreck diving is always interesting. On limited penetration wreck diving, divers can dive in the ruins but must remain in the sun, similar to cave diving. Divers need training to develop skills to safely penetrate the ruins. Special diving equipment includes penetration lines, lights, and possibly excessive air supply. Being able to explore inside the wreck also means you can see things left in the wreck of the ship. Limited penetration which allows divers to explore more shipwrecks that can often explore cabins that open to the deck or even hangar in several military ruins. It is known as full penetration, and this is a type of technical dive that requires special certification. Training for full penetration diving builds on the skills developed for limited penetration diving. You will learn skills that allow you to dive safely in a full environment. This requires special equipment such as excessive air supply, longer penetration rolls, and ship diagrams. Full penetration wreck diving allows you to explore the entire wreck, the engine room is always attractive and very beautiful. 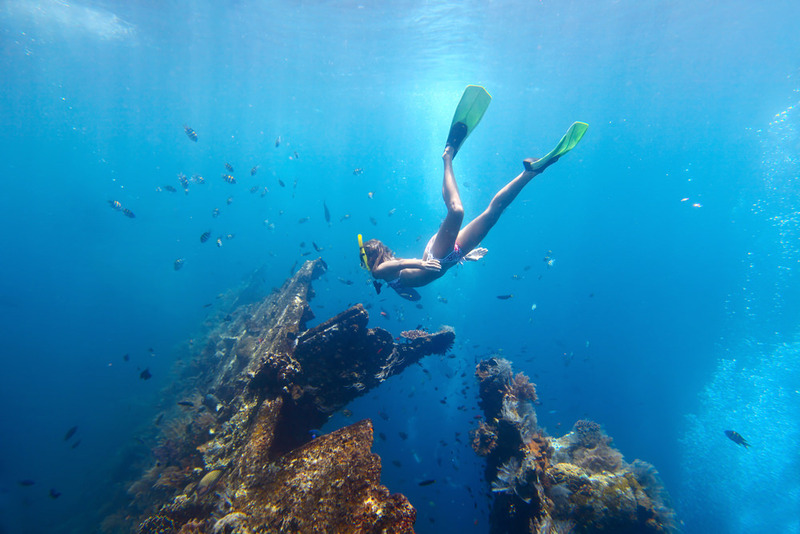 This shipwreck is one of the main reasons why divers flock to Tulamben because it is located in relatively shallow and calm waters, only 30 meters from the beach. The Liberty was built as a 120 meter long cargo ship equipped with two weapons during the Second World War. In January 1942 the ship was torpedoed by a Japanese submarine while anchored off the coast of Lombok. In 1963, it was still grounded on the beach in Tulamben when Mount Agung erupted. The bottom of the wreck is about 5 meters where the upper structure stretches up. The deepest part is about 28 to 30 meters where the bow has entered the sand. Take your time in the wreck because there are lots of macro life such as sharks, bumps and barracudas also seen here. Larger predatory fish can be seen in the structure at night. Soft corals and fans are littered with various types of pygmy seahorses also seen here. Sophie Rickmers is a huge freighter is a cargo steamship that was built in Germany in 1920. During the Second World War, the “Sopie Rickmers” was part of 5 ships that were seized by the Dutch on May 10, 1940 around Weh Island. With a wheelchair at 37 meters, a deck of about 45 meters and a straight bow resting on a base of more than 55 meters, we arranged the wreck diving as a decompression dive specifically for experienced divers. The wreck is at a depth of 50 meters in the sea making this a challenge for divers. Therefore, divers will find it difficult to see reefs and bunch of fish when diving, usually divers can only see blue walls and faint oceans. However, to find Sophie Rickmers requires patience, the deeper to swim it will be seen fish fish swimming around the ship, the wreck is home to a giant grouper, giant morays and giant trevallies. Diving through the wreck is very fun and popular these days, many things that can be enjoyed especially seeing marine species that can be found only at certain depths. To be able to doing a wreck diving you must get certification and do a courses first, especially if you want to dive into and exploring the contents of the wreck. You also have to be careful because the wrecks that are old enough will be very fragile and easily fall. Be careful around with big fishes that tries to come to you, don’t panic and stay calm.